Orange cup coral. Orange cup coral, Balanophyllia elegans Photo. 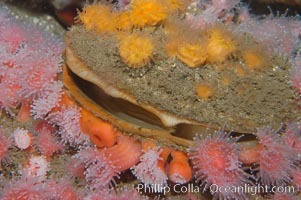 Rock scallop with encrusting orange cup corals (top) and strawberry anemones (bottom). Orange cup coral, Balanophyllia elegans Picture. Orange cup coral. 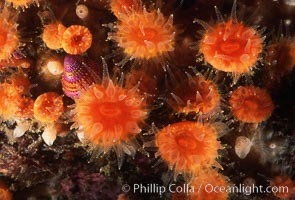 Stock Photography of Orange cup coral, Balanophyllia elegans. 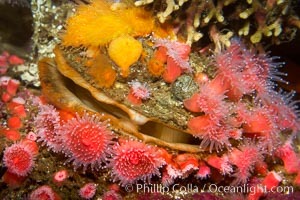 Rock scallop with encrusting orange cup corals (top) and strawberry anemones (bottom). 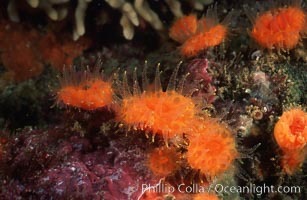 Photograph of Orange cup coral, Balanophyllia elegans.